Volkswagen has done it. 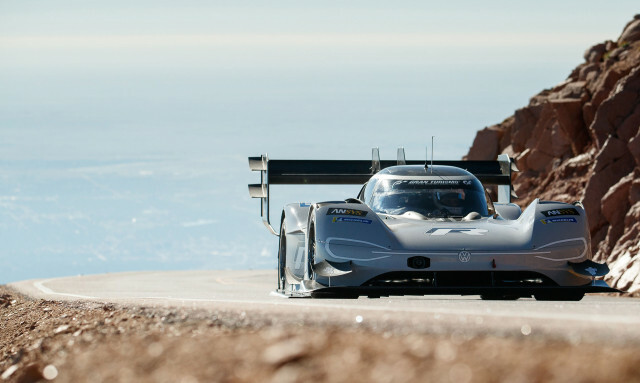 The German automaker’s ID R electric race car has not only broken the record for electric cars in the Pikes Peak International Hill Climb, it’s also broken the record for all classes by setting a blistering time of 7:57.148 during the 2018 running held on Sunday. The previous record of 8:13.878 was set in 2013 by Sébastien Loeb in a modified Peugeot 208 rally car generating 875 horsepower. The ID R was entered in Pikes Peak’s Electric Modified Class, whose previous record stood at 8:57.118. Driving the ID R was Romain Dumas, a regular at Pikes Peak and now with four wins under his belt (2014, 2016, 2017 and 2018). He set the new record with just one attempt. “The ID R Pikes Peak is the most impressive car I have ever driven in competition,” Dumas, who has competed in the World Rally Championship and World Endurance Championship, most recently with Porsche in the LMP1 class, said in a statement. The wild car features a 670-hp output from a pair of electric motors and all-wheel drive. It can rocket to 62 mph in 2.25 seconds, which is quicker than an F1 car, and can be sufficiently charged to take on the 12.4-mile race to the clouds within Pikes Peak’s regulated 20-minute interval. VW says the ID R’s powertrain is related to the one destined for its upcoming ID family of electric cars, the first member of which will be a small hatchback due in 2020. An SUV and a spiritual successor to the Microbus are also planned. The automaker says it used Pikes Peak as chance to prove its electric car technology in the harshest of conditions. It’s common knowledge that electric powertrains are well-suited to the low air density you get near the top of Pikes Peak, but the ID R was specifically tailored for the hill climb in other ways too. A combination of low weight (2,425 pounds with driver) and high downforce was also vital. Incredibly, a mere 250 days passed between the announcement and the start of the Pikes Peak project last October and Sunday’s successful run.